narrative. The essential message is one of history–the story of the God-man born in Bethlehem (24). Biblical missionary efforts have a terminus; like Paul’s work they can be completed. Thus, I committed to annual weekly meetings in a community to share the gospel after which I invited baptism. A core implication of the gospel to the Maasai, and to the world, is that the High God is God of all, not only of the Maasai. I discovered that I did not need to not preach sin or guilt, but only forgiveness (43). Christianity must be presented in a way that it can be rejected (82). If the community believed, and it was a community decision, one would become catechist and the enculturation of the gospel would be left to them all. God is near (56). The church and liturgy should take shape in a way organic to the local culture. Mission work is a undertaken by a gospel community with a transcultural vision, a special mandate, charism and responsibility for spreading the gospel to the world in hopes of establishing the Christian Church (144). Donovan’s mission to deculturize the gospel is noble but ultimately shortsighted. The gospel is not supracultural (37) but, as he says later, transcultural. It cannot exist outside of all cultures but it can be faithfully expressed and enfleshed in every culture. The scandal is that the gospel was first known in one particular culture, Hebrew culture. It is only within Hebrew culture that God appeared in the flesh. Yet, without compunction Donovan attempts to extract from the Bible’s culturally-situated writings a pristine message; from four cultured gospels he seeks a single non-Jewish Jesus (57). Lesslie Newbigin, a missionary whose ideas bear a striking resemblance to Donovan’s, offers a more helpful approach. Rather than seeking to plant a pure gospel seed in native culture and let it grow wild (59), Newbigin suggests that a healthy native Christianity is cultivated by the mingling of three realities: the self-awarely cultured Christianity of the missionary (for it can never truly be decultured), the local culture (for God has already been at work within it) and the Bible (which offers an independent and authoritative critique of both from its own unique cultured position). Without this triad of cross-cultural relationships, the gospel will inevitably succumb to syncretism as perhaps Western Christianity has demonstrated. A personal anecdote came flooding back when Donovan said to Ole Sikii, “I was sent to you.” I was flying from LA to Seattle seated next to what I would have uncharitably described as a typical Orange County woman–over made-up, reading US magazine, reeking of hair product. In my superiority I was not interested in talking but before I knew it we were in the midst of a sincere discussion about God’s existence. I was probing her obvious hopefulness when she said, “I guess I’m just waiting for a sign from God.” What I said next was anything but premeditated: “Well, here we are at 30,000 feet and I’m sitting here telling you that God’s real and is after you. How do you know I’m not sent as that sign you’ve been waiting for?” God is the lion, indeed. And I, more than that lady from the OC, got devoured that day. 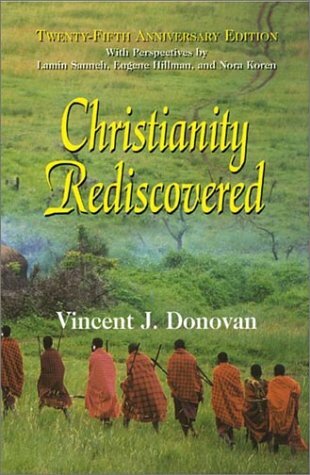 For more thoughts on Christianity Rediscovered see Contextualization in Kenyan Contexts which compares Donovan's approach to two others, including that of Lesslie Newbigin. Two, you refer to page 37 to state that gospel is not supracultural but transcultural. But page 37 paragraph 2 seems to me that Donovan meant what you meant, the gospel message is supracultural.